JANUARY 17, 2013  For band directors, the thrill of receiving an invitation to the Presidential Inaugural Parade is accompanied by the reality that they need to prepare for a trip to a major national event in a short time. Very short. As in one month. By contrast, bands heading to prestigious events such as Macy's Thanksgiving Day Parade or the Tournament of Roses Parade typically have 12-18 months to prepare and raise funds. Yet the short timeframe is a small price to pay for the experience, according to Scott Kummrow who directs the Fergus Falls High School Marching Band from Fergus Falls, Minnesota. The band also performed in the 2009 Inaugural Parade. "I tell people that if you have a patriotic bone in your body, you will be affected by what happens on that day," Kummrow said. "There were so many moments where I had a lump in my throat, a tear in my eye, and goosebumps running through my body." The citizens of Fergus Falls rallied instantly and in 23 days the community exceeded the band's fundraising goal. "We found out about the trip on December 19, just two days before the holiday break," Kummrow said. "That made me nervous about fundraising more than anything else. It was hard to get momentum going during that time." The band set an initial goal of $60,000 to cover hotel and bus costs, and they reached that amount on January 11. The band then decided to increase the goal by $7,000 to cover the cost of meals on the trip, and they have met that figure as well. "I was confident this community would step up to lighten the financial burden for families so that all band members could go. But I didn't dream it would be like this," Kummrow said. With donations still coming in, Kummrow has announced a plan for any money that may be left over after all the trip expenses are paid. "Our uniforms are 20 years old so we are going to use the extra money as 'seed' money for uniform fundraising," Kummrow said. "We've been very up-front with the community on how we plan to use the money." When the band does get the chance for new uniforms, it's likely they will maintain a classic and patriotic style. "We have found our identity in patriotism and what we refer to as traditional marching," Kummrow said. "A large part of it is what my predecessor Jim Iverson instilled in the program." 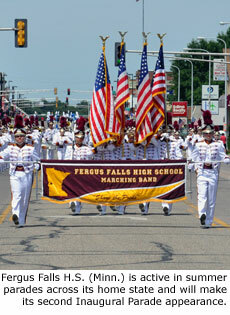 The patriotic approach makes Fergus Falls a particularly good choice to march in Washington, D.C. The band's honor guard carries multiple American flags, the color guard features red, white and blue flags, and the band plays music such as Yankee Doodle Dandy. At one point of the performance, band members will even sing a chorus of the tune over a drum cadence. The band members are rehearsed and ready, although an icy cold snap altered some of the band's original rehearsal plans. "We practiced in our local mall. The hall was just long enough to let us play through the routine one time," Kummrow said. Another band participating in the 2013 Presidential Inaugural Parade also has experienced a whirlwind of preparation. The Jackson Memorial High School Jaguar Band from Jackson, New Jersey learned of their invitation on December 23 while they were in the midst of packing for their appearance in the Pasadena Tournament of Roses Parade. With the Rose Parade scheduled for January 1 and the Inaugural Parade scheduled for January 21, band members are having the rare chance to perform in two national events during the same month. 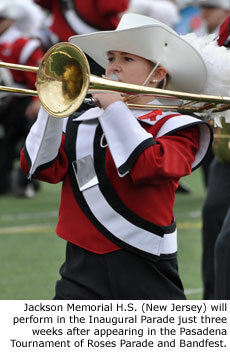 "This is proving to be a great boost for our school," Jackson Memorial Band Director Bud McCormick said. "Because we are located between Philadelphia and New York City, we've been featured on television stations in both markets. We have had newspaper reporters and TV camers in the school every day. The kids, the school and the town are very excited. The recognition we are getting is unbelievable." McCormick said the band even has the possibility of gaining a spot in the Guinness World Records, for being a musical group to perform in front of the most people in a single month. McCormick and his staff worked on many details of the Inaugural Parade trip while in Pasadena. One aspect that simplified the planning is the fact that Jackson is only 200 miles from Washington, D.C., which meant travel planning and fundraising were less complicated. A big task was assembling the paperwork for security officials, including Social Security numbers and medical forms. McCormick credits his marching band staff and the students with helping everything come together smoothly. "We have great staff members who all have a lot of drum corps and marching band experience. And we have a lot of motivation from this year's senior class," McCormick said. Even though McCormick had to work on some of the arrangements while on the Pasadena trip, he already had a good idea what to expect because his band was also in the 2005 Inaugural Parade. Most people expect that security would be tight for a parade of this stature, but McCormick explained it's still eye-opening for the students. "Our report time for inspection is 7:15 AM even though the parade doesn't begin until after 2:00 PM," McCormick said. "It's incredibly in-depth. They take things apart, they look down the piccolos, they scan everything like at an airport except they do it twice. The process takes about two hours." During the long wait between the security inspection and the performance, band members will receive a lunch courtesy of the Presidential Inaugural Committee. The band also has strict instructions to not play their instruments during the swearing-in ceremony which will take place nearby. The 2013 Presidential Inaugural Parade will be held Monday, January 21, at approximately 2:35 PM (Eastern) following the ceremonial swearing-in ceremony scheduled for 11:30 AM on Capitol Hill. Multiple television networks including ABC, CBS, NBC, CNN, C-SPAN, FOX News Channel and Telemundo will be covering the inauguration festivities. Coverage of the parade will vary, but it is anticipated that all of the networks will at least show the parade as background of their ongoing coverage.